Did you know that it costs five times more expensive to get new customers and clients than to get repeat orders? The logic here is simple: the fact that they bought from you before makes it easier to convince them to purchase again. For this to work, however, the previous customer must be compelled by your service for them to buy the second time around. I say this because the same principles apply to people who have visited your site! Instead of waiting for them to reach out to you, you can convince them to become leads faster. It’s all about setting up a remarketing campaign in Google Adwords. Why should I do Google Adwords remarketing in the first place? Nothing in the world comes free. Not even the traffic that you get from Google. You have to work for your site to get on the first page of Google. Effort costs money as well. The same applies to Google Adwords remarketing – you pay Google to feature your site on the Google Display Network. But compared to other marketing tactics, people are likely to convert through remarketing by 70%. Also, the CTR of a remarketing ad is ten times higher than a regular display ad. The fact that the person visited your site tremendously helps in the performance of remarketing ads. As a form of display ads, it helps you cut down costs and get higher ROI. For these reasons, remarketing ads are perfect if you want to make the most of your market. It is considered one of the basic marketing tactics for businesses in developing countries and economies. But enough about why you should create a remarketing ad campaign. It’s time to discuss how! First, you need to establish the goals of your remarketing campaign. Do you want to target visitors who didn’t do anything on your site? How about visitors who placed orders in their cart but didn’t check out? Or do you want them to see a page on your site they haven’t seen before? You need to identify your goal before creating the campaign on Google Adwords. Before you proceed with creating your campaign, you need to create a remarketing list first. It identifies the people who visited your site before. You can read the directions on how to create your list here. For starters, login to your Adwords account, click the Tools icon, and select “Audience Manager” under Shared Library. In the Remarketing tab, click on the + icon under Audience List and choose “Website Visitors.” For this example, we’ll focus on creating a campaign for website visitors only. You can choose other options if you have a mobile app or a Youtube channel. Fill out the form on the next page to create your list. It’s that easy! Next, you need to set up your remarketing tags. Back then, you had to copy and paste the tag code on your site. Nowadays, you don’t have to do that. Next, go to your Adwords account, click on the Tools icon, and select “Audience Manager” again. 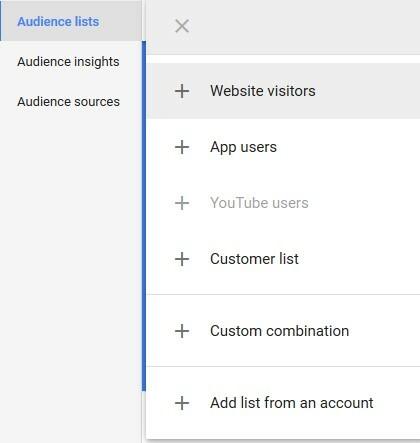 Then go to Audience source tab on the left and select Google Analytics. Fill out your details there to successfully connect your remarketing tag to your Analytics account. Go to Campaign on the left sidebar and click the + button to create one. Upon choosing a goal, you need to select the campaign type. Choose “Display” so your ads will appear on sites and app that are part of the Google Display Network. This increases your chances of converting your target visitors into customers. Next, choose “Standard display campaign” and enter the URL of the site where you placed your remarketing tag. On the next page, you need to fill out the details regarding the name of the campaign, your proposed bid, and budget. Next, you need to create an ad group. This part is where you can set up your remarketing list. Under Audiences, click “How they have interacted with your business” and select the remarketing list you just created. If you want to remarket ads on Youtube, the process will be different. For more info on how to set up your remarketing campaign, click here. Before launching your campaign, you need to create an ad to appear in the Display Network. Much has been said about creating the best ad for your Adwords campaign. However, you can find the best tips in this article. What’s crucial with creating your ad is tracking and measuring its progress. It’s not enough to know how many clicks you’re getting to your site. What’s more important is answering the questions why you’re generating the number of clicks you’re getting now. For inspiration on creating your ad copy, check out these examples featured in this post at PPC Protect. Setting up a remarketing campaign is not that hard. But if we are to be real, what makes it hard is getting the most results from your campaign. It needs to be set up the right way so the right people will see your ad. More importantly, your ad needs to compel your visitors to action and turn them into customers. By following the guide above, you can set up your remarketing campaign on Adwords in no time!